Stroller Warriors Running Club of Camp Lejeune, one of forty-three Stroller Warrior® chapters Worldwide, will be bringing a team of more than thirty participants to the 13th Annual Jacksonville Run For The Warriors race on May 19th! This group of military spouses united through fitness, motherhood and military life. 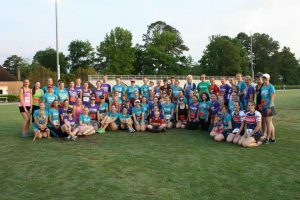 They have been empowering one another and running the Jacksonville Run For The Warriors race with their little warriors since 2010, shortly after their chapter’s establishment. Stroller Warrior Coordinator, Kayla Skinner, shares what motivates the group to support Hope For The Warriors and the Run For The Warriors race series. “Hope for the Warriors has touched the lives of thousands of service members and their families through their various programs for over a decade. As a Stroller Warrior, supporting Hope for the Warriors and, by extension, the families they serve is of utmost importance. Charities like Hope for the Warriors provide vital support for service members and their families. It requires courage, hope and conviction to recognize where help is needed and take action. Stroller Warriors is a military spouse and family lead fitness group whose mission is to help military families around the world live happier, healthier lives through fitness, friendship, leadership, goal-setting, networking, fundraising and community service. To get involved and find a chapter near you visit: www.strollerwarriors.com.